About 20% of Americans have a functional disability that impacts their ability to walk, climb stairs, hear, see or grasp an object. Because of this, new buildings today often have wheelchair ramps, accessible lifts and disability parking spaces, allowing anyone with disabilities to gain access to a building. In the United States the Americans with Disabilities Act establishes design standards for public spaces, such as local and state government facilities, commercial buildings, and hospitals. The lesser-known Architectural Barriers Act mandates that federally-funded buildings that were leased or constructed after 1968 be accessible to people with physical disabilities, while the Fair Housing Amendments Act of 1988 outlines specific building accessibility requirements for newer multi-family residential buildings. Providing barrier-free physical access to commercial buildings, public spaces, and government facilities isn’t just a matter of compliance with the law — it promotes equal access and housing for everyone. Good building accessibility means creating spaces that are designed to be user-friendly for everyone, including people who use wheelchairs, canes and mobility scooters, and those with vision and hearing impairments. Eliminating barriers to physical access can help business owners increase revenues while improving the safety of all building users. Narrow doorways, steps, heavy doors and poor signage can all make accessing a building difficult for those living with a physical ailment. The first goal of architects, project managers and contractors who are working on improving building accessibility is to remove traditional design features that could pose a challenge to people with mobility issues. This process could involve consultation with accessibility experts, occupational therapists and other professionals who focus on barrier-free design and execution. Once these barriers are identified, the design team works to integrate accessibility features that are both legally compliant and consistent with the overall aesthetics of the building. 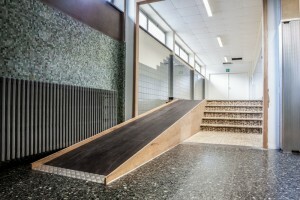 Features such as low-slope ramps, power-assisted doors, elevators and accessible washrooms are often used to improve building accessibility. At the same time, lighting, signage and even the color of the walls can impact how user-friendly a space is. Construction and design experts leverage best practices to help property owners and managers provide accessible, safe areas to all. For more information on building accessibility, contact USI online to find a branch near you. USI believes that excellence in every step of the process and ensures timely completion and quality of service, time after time. ← Can Using The Proper Insulation Make An Impact On Our Environment?